Founded in ‘95 by Marcel and Erik. Spliff strains are bred under optimal conditions in conditioned growrooms. We use carefully selected mothers and ‘fathers’ to form the most stable, viable and potent plants to produce our seeds. After yielding the seeds we handselect every seed carefully and carry out extensive tests. Tests to establish germination rate, viability and female percentages. This to ensure we provide the best possible genetics to growers. We take pride in what we do. 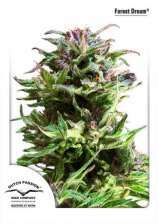 Spliff Seeds is listed as "green" at the SeedFinder. This means we absolutely can recommend this seedbank. Btw... This company is listed as a breeder at the SeedFinder, additionally you can find prices and offers for 32 strains at our pages! Tip: At the moment there are 1 reduced strains available from this seedbank! Had a decent grow with spliff AK before and was curious about the autoflower version. Grew 5 plants outside, they were short but had good looking buds. The order is shipping to China, use near one month for shipping days. Customer service is ok, they will answer you questions immediately. war das Päckchen da und zwischendurch wurde ich per Mail auf dem Laufenden gehalten. Klasse Firma, können sich weedseed und shayana eine dicke Scheibe abschneiden.